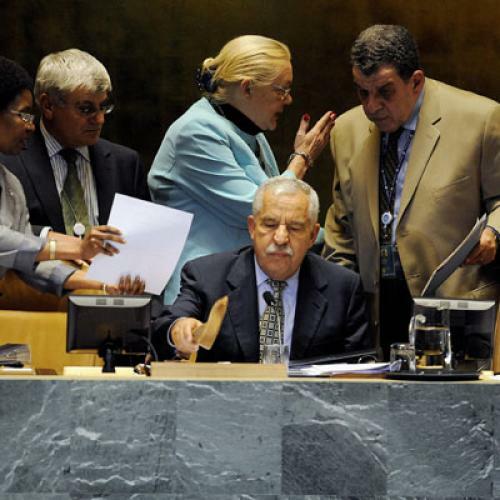 U.S., Egypt Co-Sponsor a Resolution on Freedom of Opinion and Expression. What the Hell is Going on? Only the A.P. Reported This: I Wonder Why. This was the maiden sally of the United States at the U.N. Human Rights Council, a resolution under the rubric of "promotion and protection of all human rights, civil, political, economic, social and cultural rights, including the right to development." Phew! The measure was introduced by the U.S. and by Egypt, which, of course, has a long and sterling record as an insurer and defender of civilized liberties. After all, earlier this year, Freedom House gave the Cairo regime a ranking on its freedom of the press index, placing it with three other bastions of human rights at 128th out of 195 countries--a notch above the Central African Republic and a few notches below Congo (Brazzaville). Are we to expect that soon America will co-sponsor a motion with Saudi Arabia on the liberties of women? The resolution passed in a voice vote, which means by acclamation. I am sure that the delegates from Cuba and China and other paragons of press freedom also shouted "aye" to the question. In any case, there was no "nay" or "abstain" recorded. So that settles it, I suppose, "freedom for all." Doubtless that the crime of insulting the president of Egypt, which can get you five years in jail, will vanish from the books ... and maybe from the courts, too. On the other hand, do not count on this. "Also expresses its concern that incidents of racial and religious intolerance, discrimination and related violence, as well as of negative stereotyping of religions and racial groups continue to rise around the world, and condemns, in this context, any advocacy of national, racial or religious hatred that constitutes incitement to discrimination, hostility or violence, and urges States to take effective measures, consistent with their international human rights obligations, to address and combat such incidents." Please believe me: This is not a response to the stereotyping of Jews. That's a sacrosanct practice among the Muslims. It is a response to people who wonder why the world of Islam stood still. "Stresses that condemning and addressing, in accordance with international human rights obligations, including those regarding equal protection of the law, any advocacy of national, racial or religious hatred that constitutes incitement to discrimination, hostility or violence is an important safeguard to ensure the enjoyment of human rights and fundamental freedoms of all, particularly minorities." If you think that this does not look all the way back to Voltaire's enlightenment up until the Copenhagen cartoons, you are mistaken. The document also states that "freedom of expression carries with it special duties and responsibilities, in accordance with article 19 (3) of the International Covenant on Civil and Political Rights." Article 19 (3) of the ICCPR, for the record, allows that freedom of expression "may therefore be subject to certain restrictions, but these shall only be such as are provided by law and are necessary: (a) For respect of the rights and reputations of others; (b) For the protection of national security or of public order, or public health and morals." This is all dangerous mischief. Perhaps, if the country had not been riveted on health care or on Afghanistan, even this arcane verbiage would have been subject to some public scrutiny, the public scrutiny it deserves. And there was a commentary on the Weekly Standard's web site by Anne Bayevsky, director of EYEontheUN.org: "You Can't Say That: At the UN, the Obama administration backs limits on free speech." "The United Sates is very pleased to present this joint project with Egypt. This initiative is a manifestation of the Obama administration's commitment to multilateral engagement throughout the United Nations and of our genuine desire to seek and build cooperation based upon mutual interest and mutual respect in pursuit of our shared common principles of tolerance and the dignity of all human beings." What is he talking about? "Common principles of tolerance and the dignity of all human beings," indeed. I know nothing at all about Doug, who served previously in the Galapagos. He is not the Douglas Griffiths who has 53 friends on MySpace. But I do know something about Esther Brimmer. Nothing especially elevating or especially derogatory. She is the assistant secretary of state for international organization affairs, and it is in this capacity that she issued a statement (which as far I can see on the Web got no press attention at all) about the American co-sponsorship of the resolution at the Human Rights Council. It has been, she exuded, "a terrific learning experience." Now, I wouldn't think that the assistant secretary of state for international organization affairs should be learning on the job. Of course, her first work seems to have been at McKinsey, where you earn oodles of money for learning on the job. But enough is enough. This is important work. She asserted that the resolution "confirms the central role of free speech, open debate and the battle of ideas in combating racism, racial discrimination, xenophobia and other forms of intolerance." It does not. Someone, please find me a reference that at all relates (not even favorably) to the "battle of ideas," let alone the battle of ideals. Ms. Brimmer added that the Obama administration "thought it was important to bridge the gaps that have appeared in the past in the Human Rights Council, and to bring together Western states, [Organization of the Islamic Conference] member states and to transcend previous gaps here." She is apparently a friend of both Susan Rice and Madeleine Albright. Adequate credentials.